I really loved Susanna Clarke's Jonathan Strange & Mr. Norrell when I read it years ago in college. But probably one of the first words used to describe that novel is "uber-long." It's a very hefty tome. 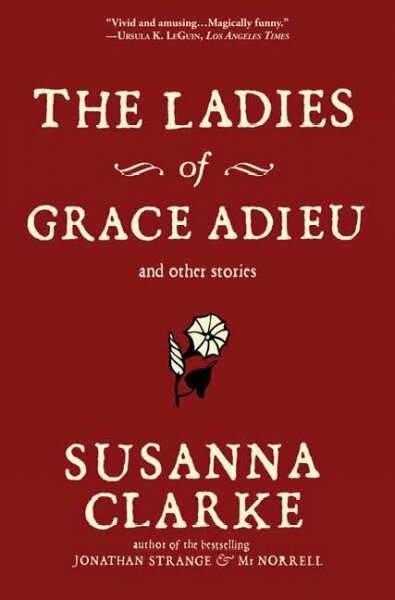 So when I heard that Susanna Clarke also wrote short stories, I admit I was a little skeptical. Can an author who imbues her stories with so much rich detail, who develops characters and plots over hundreds of pages, also excel at the short story format? As the weather gets colder and the days get shorter, I always find myself drawn to fantasy novels. Something about magic and mischief and mayhem works so well for me as I am snuggled on the sofa with a big fleece blanket to cover me. To be fair, I read The Ladies of Grace Adieu on audiobook in my car, so there were no fleece blankets. But the magic still worked on me! One of my favorite things about Clarke's writing is how she is so well able to bring in the witty, elegant style that many of us associate with Jane Austen. This style is just as present in these eight short stories as it was in Jonathan Strange & Mr. Norrell. The stories traipse all over England and over several centuries of history, featuring a wide and varied cast from Mary, Queen of Scots to the Duke of Wellington to a poor charcoal burner to Jonathan Strange himself. And there are faeries! And many well-known folktales like Tamsin and fairy tales like Rumpelstilskin. I highly recommend this book if you enjoyed Clarke's earlier novel - the style is the same and the witty language against the sometimes dark and creepy setting is absolutely delicious to read. And if you think you would like Clarke but are intimidated by Jonathan Strange & Mr. Norrell (and all its footnotes! ), then I think this is a great way to dip your toes in and see if you are ready to tackle that book. An excellent book for the RIP challenge and as we get into the Halloween season! I'm definitely someone who was never able to read Jonathan Strange, but I LOVED this book. I listened to the audiobook, too, and it was really wonderful. I own three separate copies of Jonathan Strange. I keep thinking if I find the right format, where it doesn't look so heavy, I'll convince myself to read it. Never seems to happen. Sigh. I read Jonathan Strange years ago too but haven't read this book yet. I loved Susanna Clarke's writing so it's good to know that it's written in the same style. Maybe I'll put it on my list for next year's RIP! BUT WHY IS THERE NOT A NEW BOOK BY HERRRRRR? Ahem. I really wish Susanna Clarke would write a new book. I would lose my entire damn mind. I'm due for rereads of both of Clarke's books. Maybe I'll start with this and work back up to Jonathan Strange! I miss her style of writing. Oh, a timely reminder to re-read this. I love Clarke's writing and the Jane Austen allusions. Let's hope we have another novel from her in the future. Lovely post.